Last weekend Erik and I packed up to head to Rolling Loud in partnership with SIMPLE Mobile. Neither of us had ever been to the festival OR Miami (I know...I know, we loved it and will be back very soon) so it was a big trip! For those of you who don't know, Erik loves hip-hop, so we were both excited to check out the biggest rap and hip-hop festival in the world. Rolling Loud was held at Hard Rock Stadium in Miami, FL. With three stages set up amidst art installations and a skate park, there was music everywhere! If you've been to a music festival before, you know that staying connected at them can be a nightmare...everyone trying to upload pictures, snaps...videos. AAHHHHH!!! SIMPLE Mobile to the rescue. With SIMPLE Mobile Truly Unlimited plans we were able to get two lines of Truly Unlimited 4G LTE† Data (video typically streams at DVD quality) for just $75 a month, making it easy to stay connected all weekend. AND they had an awesome space setup on the festival grounds called the Recharge Lounge. It was the perfect spot to hop on their WiFi, charge our phones...and sit down to relax for a minute. Our looks were styled to be comfortable since we knew we were going to be doing a lot of walking. We both kept it casual, I opted for a pair of lightweight shorts with slip-ons, a vintage bag and some of my favorite sunglasses. 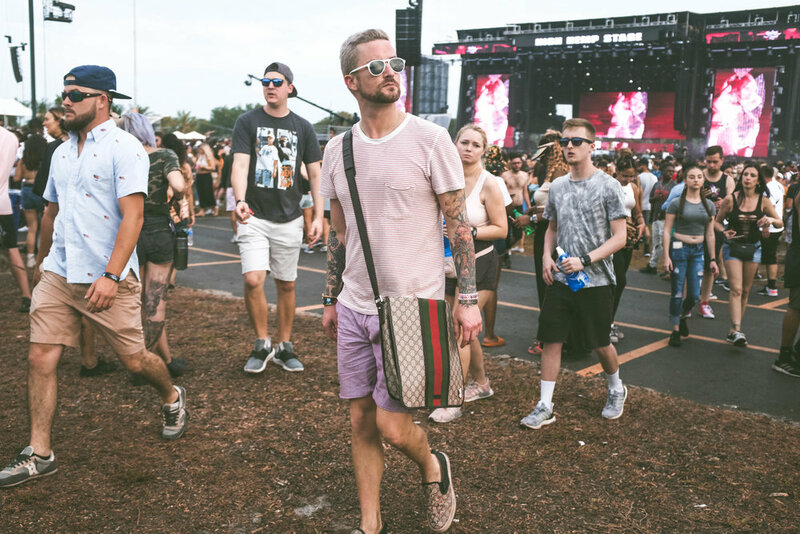 Erik was feeling extra Miami and wore a short sleeve button up, shorts, a sling bag and sneakers. I want to thank SIMPLE Mobile for bringing us to Rolling Loud!! We loved checking out a new festival and hope to make it back next year! For more information on the latest smartphones and affordable no-contract unlimited plans, check out SIMPLEMobile.com. A month equals 30 days. Please refer always to the latest Terms and Conditions of Service at SIMPLEMobile.com.